First introduced to the American market in 1984, the Dodge Grand Caravan is widely known as the world’s first minivan. Setting the standards high for future competition, the Dodge Grand Caravan is now the longest running minivan nameplate in American history. With the advent of minivan technology such as Stow N Go seating, Easy-Out Roller seating, and Swivel N Go seating, the Dodge Caravan continues to influence the standard for its segment. 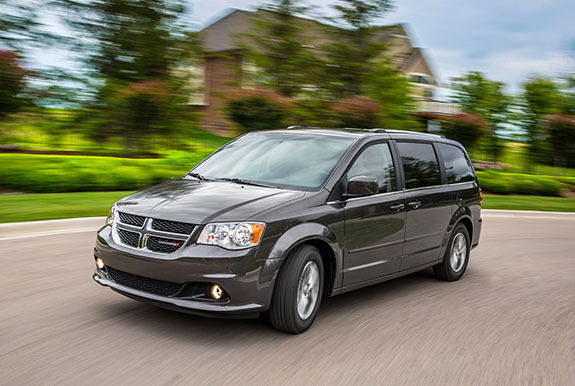 Whatever size family or budget, the 2015 Dodge Grand Caravan has options to accomodate. Offering drivers a budget option, all the way up to the R/T trim that features fully-loaded standard features, the Dodge Grand Caravan has something for everyone in the 2015 model year. The 2015 Dodge Grand Caravan marks the 31st year that the iconic minivan has been in production, and despite it being over 30, the Grand Caravan is still the best available vehicle in its segment. Not only does the Grand Caravan offer drivers more in terms of upgrades and standard features, it also offers peace of mind by being the best selling minivan in the United States. When Chrysler first introduced the Dodge Grand Caravan to the American market back in 1984, drivers who were sick of their station wagons opted for the roomier, more convenient minivans. Families flocked to the new minivan so quickly, that Chrysler was unable to keep up with demands. Shortly after the advent of the segment with the Dodge Grand Caravan, other automakers began introducing their versions. Despite new competition, Dodge continued to outsell other automakers, helping to solidify the Grand Caravan’s place in minivan history. Aside from creating the minivan, the Dodge Grand Caravan has also helped to shape it into the vehicle families today love to drive. Minivan essentials like Stow N Go seating, and sliding back doors with automatic open/close, are all features that the Grand Caravan created. Without the Grand Caravan leading the way, today’s minivan would be completely different, if it even still existed at all. Today, multiple other competitors exist in the segment with the Grand Caravan, but none of them have been able to match the original minivan when it comes to sales and overall customer satisfaction. The Dodge Grand Caravan is still the best selling minivan in the United States. At a Stand By Your Van Contest back in 2004, Chrysler introduced its brand new Stow ‘N Go seating system during the Chicago Auto Show. Ever since that first introduction, the minivan has never been the same. The competition has tried to replicate it, but no other system quite lives up to the revolutionary Stow ‘N Go seating created by Chrysler Dodge. The 2015 Grand Caravan features an exclusive Super Stow ‘N Go seating and storage system that maximizes the minivans cargo space to more than 143 cubic feet. The system is so advanced, that it takes only seconds for the second and third row of seating to fold down completely into the floor. With all of the seats in the upright position, the Grand Caravan has seating for up to seven passengers, in a comfortable seating configuration that has ample room for stretching out. Within seconds, the five back passenger seats disappear into the floor of the Grand Caravan, transforming into a work van that can accommodate an eight-foot ladder. Trips to the store that wield a large amount of groceries can easily fit with the flip of a button. 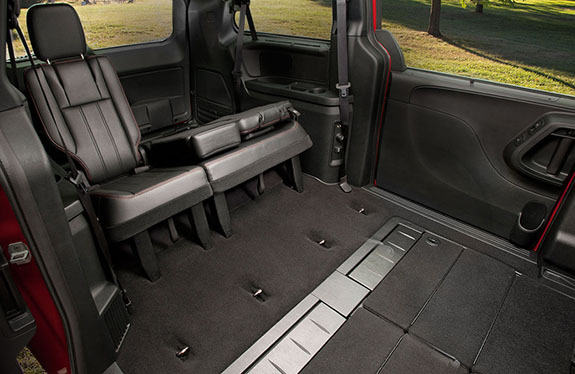 No matter what your situation calls for, the 2015 Dodge Grand Caravan’s Stow ‘N Go seating can more than handle it. American Value Package: With a starting MSRP of only $21,395, the AVP is one of the most affordable minivans available on the market today. With a 3.6-liter V6 24-Valve VVT engine, with a 6-speed automatic transmission, this Grand Caravan has enough power under the hood to get you where you need go to. Check out all of the other great standard features on the AVP. Each of the available trim levels offered on the 2015 Dodge Grand Caravan minivan are excellent choices for the busy family on-the-go.With the lowest model starting just above $20,000, and the highest-end starting under $30,000 - the 2015 Dodge Grand Caravan is truly an affordable option that has stood the test of time in the minivan segment. Others have tried to imitate, but no other automotive brand can come close to everything Dodge offers in its original minivan - the Grand Caravan.